I have been wanting to do blueberry bread/muffins for a while now. 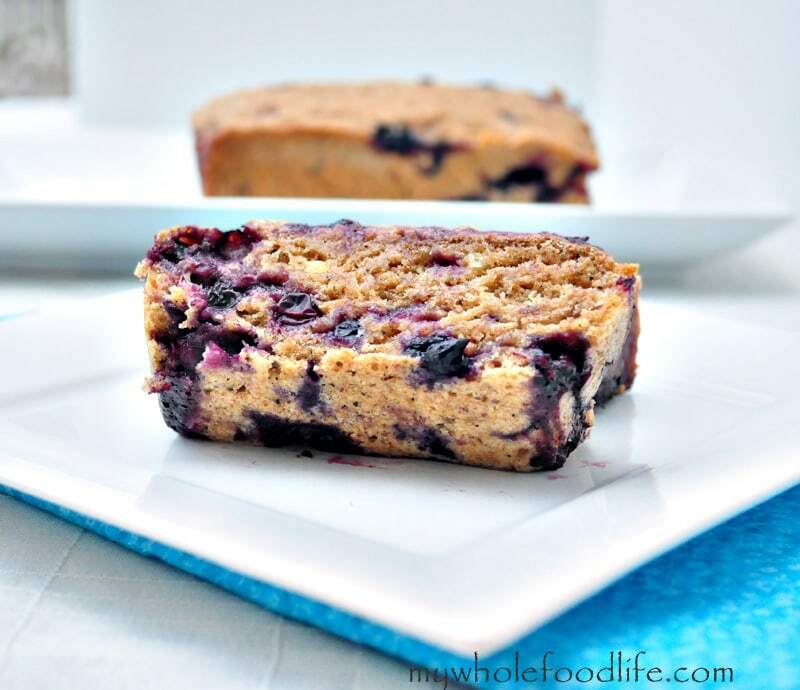 This blueberry bread came out great and can even be done with frozen blueberries. I used spelt flour in this and that is why I call it spelt blueberry bread. If you haven’t baked with spelt, I recommend you try it. It’s not gluten free, but it contains far less gluten than whole wheat. It’s great in muffin and bread recipes like this one. Growing up in Massachusetts, we had wild blueberries everywhere in the woods behind our house. I would always pick them to bake with, or even just grab a handful and stuff them in my mouth. Man, those were they days. No worries about pesticides and GMOs then. Now I just buy organic and hope for the best. Maybe we will add them to our garden. I am just not sure how they grow here in Texas. Pour in a greased loaf pan and bake for 35-40 minutes or until a toothpick comes out clean. hi, great homepage! i am wondering if t stands for teaspoon or tablespoon or maybe something else? Hi, Love this recipe! I used 1/2 cup rice milk and it turned out fine, also used mixed berries (I ran out of blueberries) and added a little cinnamon, yum! My husband can't get enough and my 1 year old loves it! I am really excited to try some of your recipes for my 4 kids to replace processed snacks and treats. I am not a banana fan at all. Just wondering if you find applesauce to be an acceptable replacement in most recipes? Yes it usually can be a substitute in most recipes. Trying this now. Stuck in the house with a lot of snow outside. Using whole wheat pastry flour and mixed berries since I didn't have enough of just blueberries! I also did the Ener G egg replacer since I didn't have flax. Hoping it comes out good! I hope you enjoy it! Stay warm. Yes I would add 1-2 tsp lemon zest and maybe 1 tsp lemon juice? You shouldn't need to cut the milk at all since the amount of lemon is so small. Ok will do, thanks for the response! You can just add an extra tablespoon of applesauce. Do you generally use whole spelt or white spelt flour in your baking? This looks good! Could I substitute amarynth flour for the spelt? I am not familiar with amarynth so I am not sure. I just tried this recipe the other day and they were amazing! Question, I have coconut flour and kamut flour. Can I substitute the spelt for anyone of these? I'm running low on spelt. Thanks! Coconut flour can be tricky to bake with. If you want to use it in this recipe, you will need to add a lot of eggs. I have never cooked with kamut flour, so I am not sure about that one. Do you think this could be made in a muffin pan?? My account accidentally got flagged as spam on Pinterest. It's happening to a lot of bloggers lately. I have put 3 emails into them and I am waiting for them to fix it. :( Thanks for your patience! I am so sorry. That's ok, im sure you will get it sorted, good luck! Love your recipes ..
Melissa, this is delicious! I think it's my new favorite recipe...moist, sweet and delicious. I love the texture of the bread, and it's sweet enough to serve as dessert. It doesn't even need butter. Just a super recipe!